Buenos dias St. Paul’s family. We have had an adventurous 24 hours of travel filled with flights, and a VERY long van ride to the beautifully green, mountainous town of Coban. Our van journey included driving through the night in a tremendous rainstorm, avoiding large boulders in the road, and some rather rough terrain. 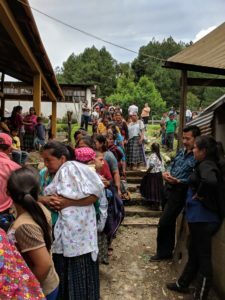 Our weary bodies were soon rejuvenated when we finally found Rosa’s house in Coban and were greeted with warm embraces, tears of joy, and lots and lots of smiling faces. As Rosa was walking us through the entrance to “Bethlehem” I first was struck by the beauty of the lush, green, landscape. The property is wonderfully open and sits atop a hill overlooking a natural spring and agricultural hillside. Isaiah 25 started going through my mind. I encourage you to read it this week. Verse 4 in particular was being made manifest right in front of my eyes. “You have been a refuge for the poor, a refuge for the needy in their distress, a shelter from the storm and a shade from the heat.” This text goes beyond talking about the deliverance of the Jews from captivity. I think it goes further to point out Christ’s victory over our spiritual and physical hardships and the comfort only Jesus can bring to His Church. The imagery of the mountains and banquet lined up so perfectly with what the ten of us were seeing in person. We gathered together as Christ’s Church to worship and praise Him together. Three languages were being spoken simultaneously to proclaim Christ crucified on the side of a mountain. We lifted our voices to praise the God who continues to provide for His people in Baltimore and His people in Coban.